Use Holbein watercolor mediums to create interesting effects and enhance the properties of watercolors. Gum Arabic Paste — Holbein Gum Arabic Paste results in an impasto effect when mixed with watercolors. 15 ml tube. 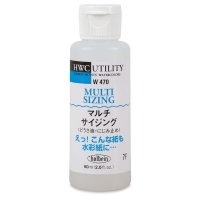 Multi Sizing Liquid — Holbein Multi Sizing Liquid is an artist-grade sizing liquid used to reduce the absorbency of paper. Dilute it with warm water and apply with a broad brush. Ox Gall Medium — Holbein Ox Gall Medium is an artist-grade wetting agent that improves flow and enhances wet-into-wet techniques when mixed with watercolors. It also improves the acceptance of watercolor paints on paper, particularly hard-sized papers. Iridescent Medium — This artist-grade medium is designed to facilitate iridescent and pearlescent effects when used with waterbased media. Gum Arabic Medium — This is an artist-grade medium that enhances gloss and transparency when mixed with watercolors. Mixing Gum Arabic Medium with opaque colors such as gouache and poster colors also increases transparency. Watercolor Medium — When mixed with watercolors, Holbein Watercolor Medium facilitates fine line and stroke development by improving flow.